The intestinal cleansing formula supports your body’s internal toxin removal system so you can clean out your liver, a vital organ responsible for fat metabolism and toxin removal. As I age, my digestive issues have become more prevalent. I have always had a sensitive stomach. As a child, I was labeled a picky eater largely because I avoided foods that made me feel ill. It is one of the reasons I gravitated towards vegetarianism naturally at an early age. In my twenties, I was diagnosed with an allergy to casein, the protein found in dairy products. At the same time, I became a vegan, as well as gluten-free. My dad had been diagnosed as a celiac, and considering it is genetic, I figured it couldn’t hurt to try a gluten-free diet. This was twenty years ago before gluten-free was as prevalent. Jumping to my forties, I am no longer a strict vegan or gluten-free. I eat both in limitation. What I have discovered mostly about my digestive system, which also relates to weight gain, is that portion size is key, as well as not eating after 7:00 pm. If I eat later than that, I don’t sleep well. I also eat mostly raw throughout the day. Given my issues, I was excited to try Bell Intestinal Cleansing provided by Naturally Savvy. 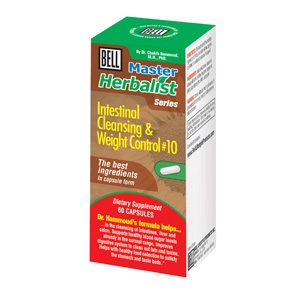 The all-natural ingredients in Bell Intestinal Cleansing and Weight Control provide support for healthy digestion, glucose balance and toxin removal. The master intestinal cleansing recipe helps support weight loss the healthy way. It improves digestion with soothing herbs and enzymes to help make digestion efficient and eliminate gas and bloating. The intestinal cleansing formula supports your body’s internal toxin removal system so you can clean out your liver, a vital organ responsible for fat metabolism and toxin removal. I am not all that concerned with weight loss, and I have previously tried herbal products for weight loss to support the five pounds that I fluctuate. None of them allowed me to eat whatever I want, which I have come to realize I can’t anyways. The extra pounds stay off if I eat according to what my digestive system can handle. I have not tried Bell’s product for more than a couple of days, and I will update this post as I see (or don’t see) results. I am very hopeful this will help support the healing of my digestive system from when I occasionally break the rules and eat a piece of chocolate cake my daughter made. I have found that probiotics and chia seeds are an essential part of making my digestive system work. Pancreatic enzymes, brome lain, okra, turkish rhubarb, coleus forskolii, prickly cactus, java tea, marshmallow root, dandelion root, beetroot, burdock root, rosemary.